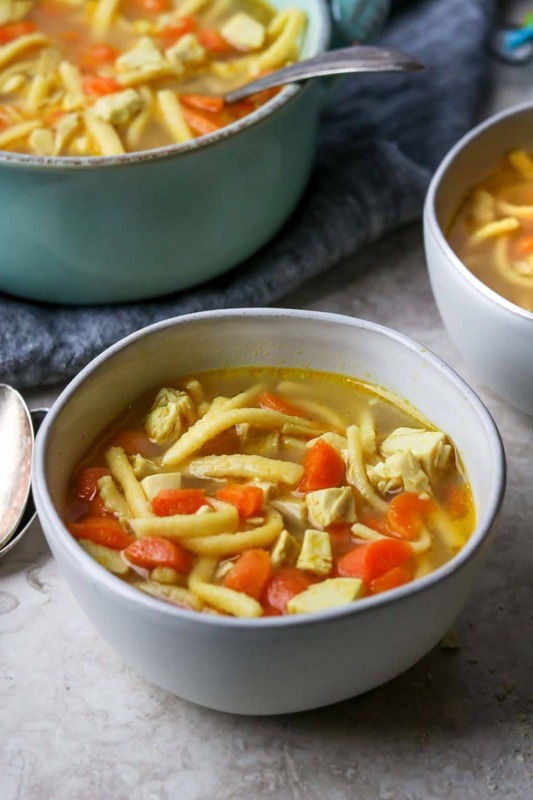 This recipe for Chicken Noodle Soup for Kids is the perfect kid-friendly soup. It is full of flavor but not full of ingredients that kids hate. No onion, no garlic, no celery, and no green stuff! 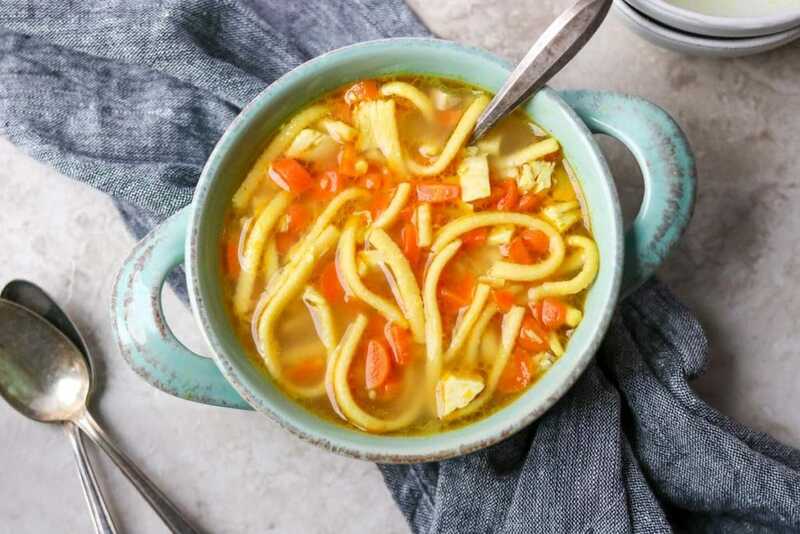 It is a homemade chicken noodle soup, with a few adjustments that make it a kid friendly dinner, perfect for your picky eaters. It will be the dinner your kids will ask for again and again, and eat without crying. Isn’t that what we all want, no tears at dinner. I have the most wonderful niece, Ashley. She is the kind of girl you want your younger girls to look up to. She loves being in the kitchen and learning how to cook, which you know I love and am more than willing to show her everything I know. So, over the Holidays I had her make my Chicken Noodle Soup recipe. She made it perfectly! I thought it would be her most favorite soup recipe ever. However, when she sat down to eat, she picked around the celery, chicken, and onions. She only wanted to eat the thick egg noodles (which, btw, are awesome), the carrots, and broth. That got me thinking…. most kids like a soup that only has the carrots, broth, noodles, and chicken. 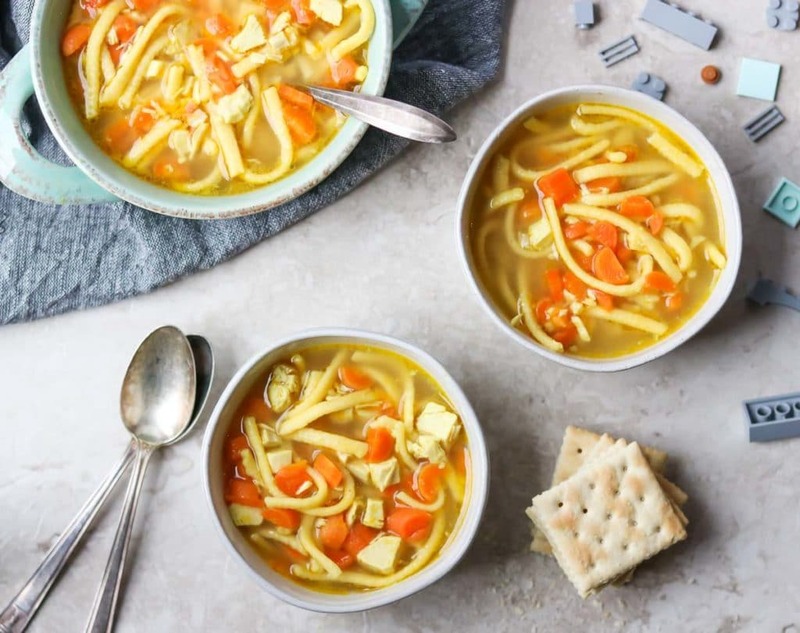 So why not create a kid-friendly chicken soup recipe that has a good amount of flavor, and that the kids don’t have to pick around the things they hate. And so my Chicken Noodle Soup for Kids recipe was born! I hope your kids love it. If you love a quiet night and a peaceful dinner, for the love of God use the noodles that your kids like to eat! I know that all pasta tastes the same, but I don’t think my kids do. If I make angel hair pasta instead of penne, my kids won’t eat it. The struggle is real. 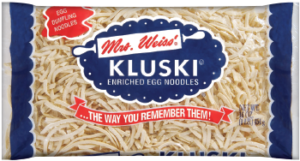 In this recipe I recommend using Kluski Noodles, which are very similar to the noodles in canned chicken noodle soup, or Spaetzle Swabian Egg Noodles (I get them at Aldi and they are the BEST). 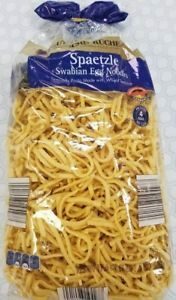 You can also use Reames frozen egg noodles, if your kids love the thick noodle and the egg-y pasta flavor (It’s what my niece prefers). If you use the Reames frozen noodles, just up your cooking time to 20 minutes. Of course you can also use a tiny star shaped pasta, called Pastina, or wagon wheels, or ditalini, whatever your kids will like and eat. You can also use poached chicken or roasted chicken, or my All Purpose Instant Pot Chicken recipe. Whatever chicken you use, I recommend cutting it into a small dice so your kids won’t complain about large chunks of chicken! So much work for such small human beings! First, do not even think about grabbing an onion or garlic. We may want those flavors in the soup, but we do not want our kids to KNOW that flavor is in there. So, we will add the onion and garlic flavors by using powder instead of the real thing. Sneaky! I call them “invisible ingredients”. Now, grab those baby carrots that you put into the kids lunches, the one vegetable they will actually eat. Right! Slice those up into a small dice. Saute those carrots in a little olive oil for about 5 minutes. 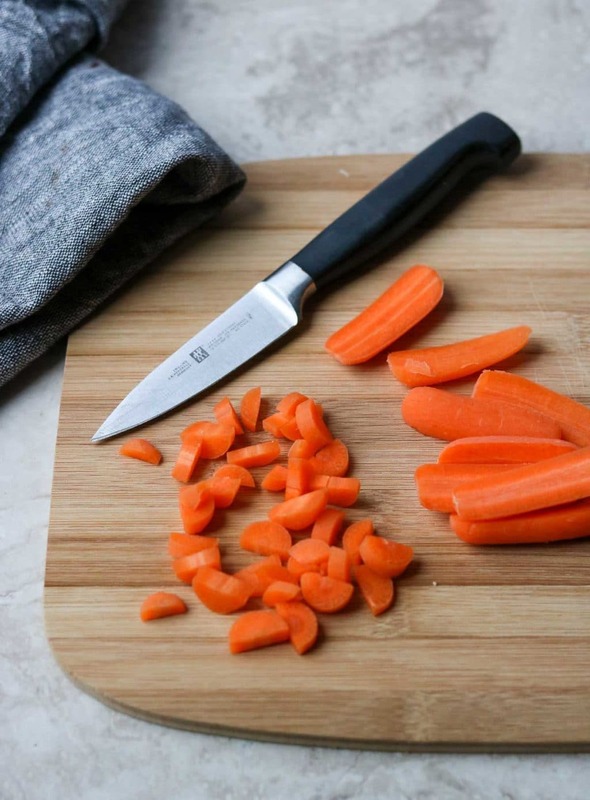 Do not let them brown because for God’s sake, you know they will be able to taste that you burned the carrots and then your delicious soup will all of a sudden be hot garbage. Next, add all the sneaky seasonings to add flavor, but not too much flavor, we are feeding kids after-all. Now pour in the broth and stir in the chicken base. Increase the heat to medium/medium-high and bring the soup to a simmer. Now serve a bowl of this soup to your kids with confidence! 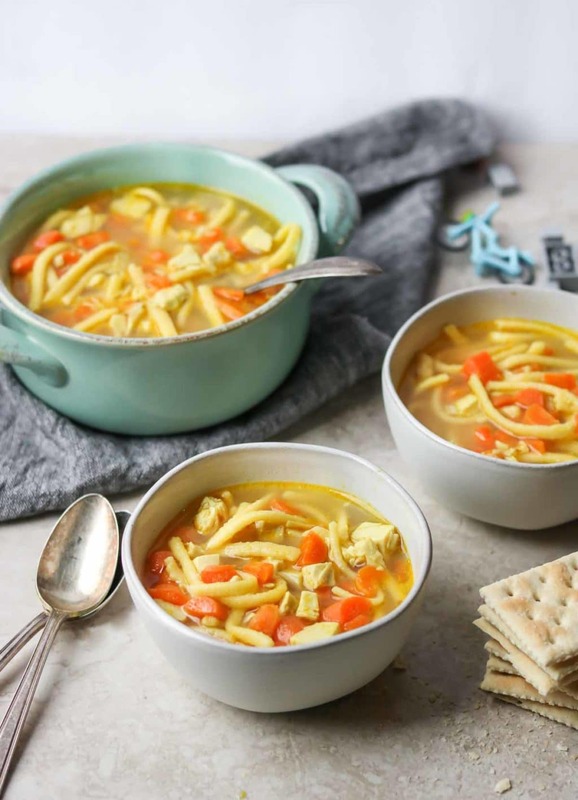 I hope you give this recipe for Chicken Noodle Soup for Kids a try in your kitchen. 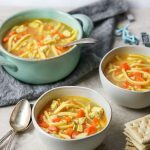 A Kid Friendly Chicken Noodle Soup Recipe that doesn't have any ingredients that will offend your picky eaters. No onion, no celery, no garlic, and no green things!! A kid friendly dinner that still has all the delicious flavor that you want in a chicken noodle soup. In a large pot, over medium/medium-low heat, saute the carrots in the oil for 3-4 minutes. Stir in the garlic powder, onion powder, salt, celery salt, and turmeric powder. Pour in the chicken broth and add the chicken base, stir to combine. Turn the heat up to medium/medium-high, and bring the pot to a simmer. Add the noodles and chicken, cook for 12-15 minutes, until the noodles are cooked thru. This soup will reduce slightly as it sits, as the noodles absorb the broth, you may need to add additional broth (or water) when reheating. I had this for dinner and loved it just as much as the kids. There is a ton of deliy flavor in this soup!